Between the equipment, materials and foot traffic coming in and out of a construction site, it’s important that floors remain protected in the process. To avoid scratches and stains, nearly all construction projects need temporary floor protection. Whether you are working on a residential renovation or a large-scale industrial project, take note of these four quick tips for using construction floor paper rolls on job sites. For your project to go off without a hitch, preparation is key. Whether you’re working with new or existing concrete, wood, tile, stone, linoleum, vinyl or something different, be sure to clean the surface well before laying out your paper cover. A clean floor will prevent against scratches from trapped debris. To get the most value from your construction floor board, find a heavy-duty, reusable product that lays out fast for the project. This will save you time and money while giving you peace of mind that your floor is protected. Once your construction paper is swept or vacuumed thoroughly, you can re-roll and store the paper in a secure place for your next project. Your construction floor paper only works as well as the tape used to secure it. After you roll out the paper and cut it to size, be sure to use a durable construction tape to keep your paper connected and in place. Though it is mostly used on the floor, your construction board doesn’t have to be limited to one use. Try protecting wall surfaces, stairs or counters from water, paint or mud during an installation or renovation. At Oren International we offer construction floor paper rolls that are 38 inches wide by 100 feet. Our rolls weigh 45 pounds each, are packaged 16 rolls per pallet, and the board is a high-sized .042 chipboard. Working on a residential project? 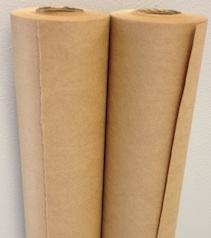 We also offer heavy kraft paper rolls that are 36 inches wide by 166 feet. For more information about how our paper converting can help you with your next construction project contact us today and learn these 6 surprising things a paper converter can do.